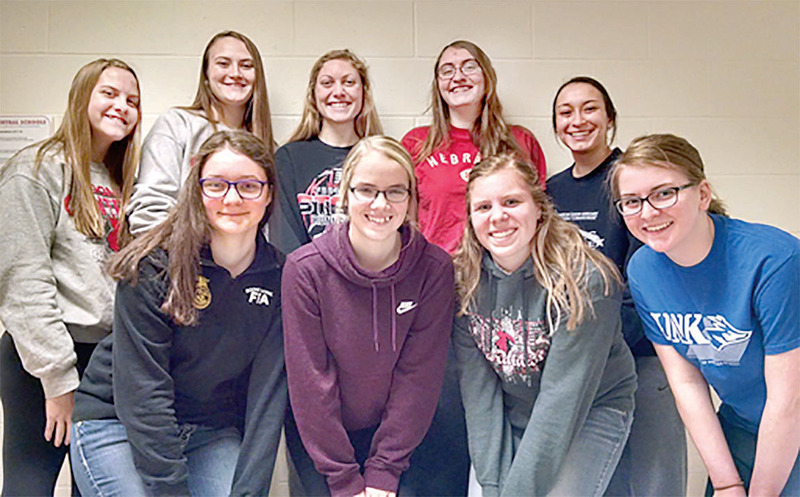 FCCLA members competing in districts were (front, l.-r.) Destiny Umbarger, Rileigh Mapel, Emily Kelley, Hailey Schademann; (back) Brooke Groth, Erin Reynoldson, Maggie Cleveland, April Johnson, Halie Andreasen. On Friday, Jan. 19, Boone Central’s Family, Career, and Community Leaders of America (FCCLA) members competed at districts in David City. The results were outstanding, as every member who competed in an event qualified for state. This is very exciting for FCCLA group adviser Lisa Groth and all of her student members, as they worked hard this year to qualify for the state FCCLA Conference that will take place April 9-10 in Lincoln. FCCLA President Hailey Schademan, who will be participating in advocacy, commented on the work she accomplished to qualify for state. “Over the course of one month I went in and worked on my project with Mrs. Groth. I had to do research on the topic I chose to advocate, then figure out ways to advocate my project,” she stated. Hailey is also looking to qualify for nationals. She was not the only hard working member. Vice President Halie Andreasen explained that she, too, had to put in extra hours with Mrs. Groth to qualify for state in senior parliamentary procedure. For months, they met almost every Friday morning to practice both their demonstration and parliamentary procedure questions that may have come up on the written exam. Maggie Cleveland, another senior FCCLA member, qualified for state, along with Halie, in parliamentary procedure. She explained that both she and Ms. Andreasen will continue to practice in the early mornings and study for the tests they will both have to take at state. For Maggie, the most exciting part about state is getting to compete at the next level, along with many other teams. Senior fashion virtuoso, April Johnson, qualified for the state competition this year in fashion construction. To prepare for this accomplishment, she sewed a dress, constructed a display board, and wrote and presented a five-minute speech. 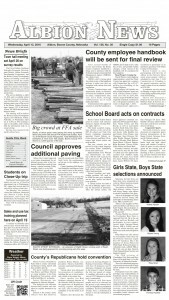 Johnson also commented that she is excited to compete at state because of the hard work she has put into the project.